On September 22-23, Converge will be hosting the Future of Obsolescence Management event in Amsterdam. Featuring various companies and several expert guest speakers from around the world, this event will provide insight on how obsolescence management is changing and on the concerns surrounding quality in the electronic components supply chain. In this blog, we interview one of FOM 2015’s expert guest speakers: Rob Picken, Director of Sales EMEA, SiliconExpert Technologies. Q: Rob, can you tell us what you will be speaking about at the Converge FOM 2015 event? A: I’ll be covering an overall aspect – personnel obsolescence. I feel that “brain drain” caused by various factors worldwide is more dangerous for long-term and platform support than anything physical. I’d like to talk about that with a wider audience, without pitching a product. Q: How do you see the future of obsolescence management? A: Great question! I see the FOM becoming a centralized function, fundamental to end-to-end product life cycle management and planning. It has to be – especially in high-criticality, high-reliability environments; otherwise, coordination between compliance, procurement and engineering becomes almost impossible, given volatile supply chains. By centralizing and working with similarly centralized entities in partner companies/suppliers, obsolescence management will become a fundamental process underpinned by contractual obligations. Q: You meet with many people responsible for obsolete management at OEMs and CEMs. What main challenges are they sharing? Do you see certain patterns emerging? A: Right now the biggest problem is the fear of missing vital information. Particularly among OEMs, that manifests itself in running hugely overinflated “safety stock” levels with their supply planners. In our language that means massive stock on hand and wasted cash. EMS providers have real issues in competitive differentiation – particularly when cost is king and you’re expected to provide a dozen services for the price of one. If the vital information you miss means that your “cheapest in class” solution hits your customers with a huge last-time buy or line shutdown, you’ve got much bigger problems. Q: What are the overall obsolescence solutions available in the market? Can you think of some that are still missing? A: There are a lot of great companies offering really compelling solutions right now that are all aimed in different ways. There are also some really interesting business models coming out of emerging markets too – Indian companies are based in a low-cost economy but backed up with fantastic expertise and market overview. Today, though, there’s a large gap in consultancy-based obsolescence management. I’d like to see more partnership-level work between Tier-one OEMs and the data/components industry to provide integrated solutions. Reducing the comprehension gaps between industry and supplier needs to be centrally coordinated, and I believe companies are trying to do it … but have something missing right now. Q: Do you agree that obsolescence management is no longer just an aerospace and defense problem? Why? A: Absolutely! As soon as environmental regulation became the prime driver of obsolescence, the risk shifted to all OEMs, including consumer OEMs. This issue now doesn’t just affect platforms/assemblies with 30-year- in-service life spans; this now affects anything with a design/approval/production cycle longer than six months – and it’s going to get worse! Q: What does an end-to-end obsolescence solution mean to you? Where does SiliconExpert fit within this spectrum you describe? A: End-to-end obsolescence means being able to produce, at any time, a risk profile of your design, production and supply chain, and to marry it with a realistic mitigation plan for every aspect of your work. SiliconExpert can readily drive the data and insight behind this capability, and we’re working hard with our sister companies, like Converge, to make this wider vision a reality for our customers. Q: When working with OEMs, Converge sees obsolescence hitting those responsible for areas such as finance and NPI planning. What is your experience? A: We do agree in a lot of ways with Converge, and this is no exception; however, I’d also add another area – stakeholders. Obsolescence can be utterly catastrophic for a company. If an event means you have a shutdown, leading to redesign, leading to re-certification and late delivery, OEMs can enter damage-limitation mode. Ultimately this can cost millions in revenue, approvals (for military/aerospace, re-certification can be extremely costly), redesign and potentially even contractually agreed-upon late-delivery or non-conformance fees. All of this can be compounded by high-profile brand damage cases. It’s extreme as an example, but we work in these situations more commonly than you’d think. It pays to be prepared and to understand the potential risks that can arise from poor planning and preparation. Q: Can you also tell us about your company, SiliconExpert? A: At SiliconExpert, we’re focused on helping our customers make better decisions, faster. We provide the relevant data and insight needed to support internal analysis and decision-making, which in turn remove risk from the supply chain. We have a large market-leading team of electrical, software and data engineers who handcraft our component database to deliver the most comprehensive and current tools in the industry. Customers choose SiliconExpert to help them manage risk, avoid redesigns and mitigate obsolescence. Q: Rob, please tell us about yourself – some personal details. A: My original career choice was to be a professional rugby player – several challenges got in the way of that, so ultimately I had to find a real job, and a winding path led me to SiliconExpert. I still love to watch all kinds of sport though, and having recently become a father. I cannot wait to live my sporting life through my son … although my wife has categorically told me his sporting career will NOT include rugby! Thank you to Rob for his valuable insight on the hot topic of obsolescence. 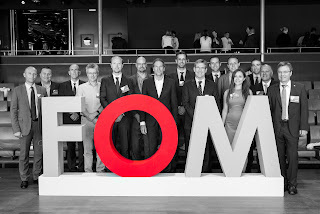 To learn more about FOM2015 or obsolescence management in the electronic components supply chain, contact us.